Quick overview Tells the story of author's explosive but agonizingly constructed fictional universe, from his initial inspirations to the posthumous sequel(s) and adaptations, bringing together a thousand tales of life as part of the British Comedy movements of the late 70s and 80s along the way. As a wise ape once observed, space is big - vastly, hugely, mind-bogglingly so. However, if you look too closely at space, it becomes nothing but lumps of rock and sundry gases. Sometimes it's necessary to take a step back, and let a few billion years go by, before any of the true wonder and scope of the cosmos becomes apparent. Similarly, the late 20th century author, humorist and thinker Douglas Adams was big - vastly, hugely and thoroughly mind-bogglingly so, both in physical terms, and as a writer who has touched millions of readers, firing up millions of cerebellums all over planet Earth, for over 35 years - and for nearly half of that time, he hasn't even been alive. It would be ridiculous to pretend that Douglas Adams' life and work has gone unexamined since his dismayingly early death at 49 but throughout the decade since the last book to tackle the subject, the universes Adams created have continued to develop, to beguile and expand minds, and will undoubtedly do so for generations to come. 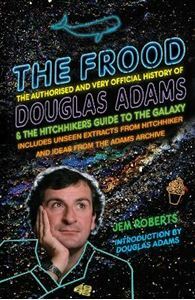 An all-new approach to the most celebrated creation of Douglas Adams is therefore most welcome, and The Frood tells the story of Adams' explosive but agonizingly constructed fictional universe, from his initial inspirations to the posthumous sequel(s) and adaptations, bringing together a thousand tales of life as part of the British Comedy movements of the late 70s and 80s along the way. With the benefit of hindsight and much time passed, friends and colleagues have been interviewed for a fresh take on the man and his works.